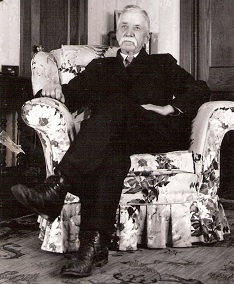 Walter S. Younkin was born on June 10, 1833 in Turkeyfoot or Milford Township, Somerset County, PA, the son of Dr. Jonas and Martha (Pringey) Younkin. When Walter was age 16, in 1849, his father struck an agreement with John R. King to let the son work for King, which may have involved writing, and that King was to provide the boy's boarding, washing, and mending in." A year later, at age 17, circa 1850, he and his family relocated to Henry County, IL. Finding that locale appealing, he and his brother Alexander remained even as the rest of the group moved again into southeast Iowa. The agreement between Walter's father and John R. King is described in Wilmer Mackey Sanner's 1968 book, The Sanner Tamily in the United States. When he was age 22, on May 5, 1856, Walter was joined in wedlock with 18-year-old Eva M. Troyer (Aug. 17, 1838-1891), a native of Canada. The nuptials were held in Cambridge, Henry County, IL by the hand of county judge Stephen Palmer. A friend once wrote that Walter "was a very fine man, his wife a fine girl and a good wife." They made their home in Annawan, Henry County and produced two offspring, Warren "Eugene" Younkin and Howard Venvelsy "Velzie" Younkin. Family friends Phoebe Hamilton was a midwife at the birth of son Warren in 1858 and Hannah Troyer helped in the delivery of their son Howard in 1862. As a young man, Walter was considered a "well-built and able-bodied man," recalled friend John C. Troyer of Annawan. He stood 5 feet, 8 inches tall, had a light complexion, black hair and blue eyes. Walter went to Peoria, IL to joined the Union Army during the Civil War on Aug. 12, 1862. He was assigned to the 112th Illinois Infantry, Company A. His initial rank was corporal and he later attained the rank of sergeant. After his health gave way, he was sent for treatment to a hospital at Fort Fisher in Wilmington, NC. The heavily armed fort -- built by the Confederate Army -- was constructed primarily of soil mounds to protect shipping lanes near Wilmington and was captured in a Union attack in 1864. He mustered out of his regiment on June 20, 1865. His name has been misspelled in official military records as "Yomkins." Upon arrival back home, friend Troyer saw that Walter was "not well, but was weakly and sickly. He appeared to be run down suffering from general decline or debility, was troubled with swelling of the feet and bloating of the abdomen. Heard him say, a short time after his return from the Army, when speaking of his poor health, that he had paid out eighty dollars for medical services and medicine since he returned from the army, and it had not helped him any." Part of the cost was paid to a physician in Chicago who agreed to cure him for a payment of $60. Walter tried to regain his life as a farmer but to no avail. He hired Lyman A. Dukelin to labor on the farm and at times went outside to make sure the work was being done correctly. Duklin observed as Walter drank large quantities of water. Ultimately, it was diabetes and gangrene that dealt Walter a death blow. He was treated medically by Dr. Hayden and his brother, Dr. Edwin Younkin. For the last seven weeks of his life, his mother Martha -- having traveled from her home in Kansas City, MO -- provided constant care at his bedside. She recalled that "he suffered greatly with pains and swelling in the feet and legs, bloating and severe pains in the bowels and kidneys; that he was very restless from the constant and severe pain and that he was confined to his bed all the time she was with him." On the morning of Nov. 19, 1868, Eva awoke and went to build a fire. She heard Walter "making a pecular noise such as sobbing or crying," said his brother Edwin. She went to the bedside and asked what was the matter. He did not answer but died in a few minutes." With his mother also at his bedside, Walter succumbed at the age of 35 in Annawan. Burial was in the nearby Fairview Cemetery. The federal census of 1870 shows Eva, with her last name spelled "Yuncan," heading a household in Annawan. Eva went on to marry twice-widowed William H. Gillaspie (Sept. 17, 1828- ? ) on Dec. 7, 1871, in Cambridge. Rev. Harvey Kingsbury officiated. The son of Simon and Juliette (Halloway) Gillaspie, William was born in Montgomery County, KY, grew up on a farm and attended school in an old log house. His two previous wives were Mary Ann Bradshaw (married March 3, 1844, died 1852) and Martha E. Bradley (married July 3, 1853, died 1870). Eva and William produced two daughters of their own, Kittie Peterson and Hattie Scherzer. Circa 1872, their home was in Abingdon, Knox County. On April 12, 1872, Eva officially was named legal guardian of their young sons as appointed by the Probate Court of Knox County at Knoxville. A Republican, William is considered the first mayor of Abingdon, having served from 1858 to 19860 and then again in 1865. He also spent several years each as City and Town Clerk and four terms as justice of the peace. He was a member of the Christian Church and circa 1878 was clerk of Jefferson Street Church in Abingdon. He is profiled in Chas. C. Chapman & Co.'s 1878 book, History of Knox County, Illinois. Sadly, they separated by 1877, and their marriage ended in divorce. Eva started to wash clothes for others to earn her and the four children's support. The 1880 U.S. Census shows Eva heading a household in Annawan with her four offspring. Son Warren, age 21, provided farm labor that year. Later in 1880, Eva and the children relocated to Saline County, NE. "They settled in a log cabin on a farm near Dorchester," said the Lincoln Journal Star. During a major blizzard in 1888, the children walked to school and "followed fence posts to find their way." And all the kind advice she gave. Many decades after Walter's death, his grave was among those marked on Decoration Day, otherwise known today as Memorial Day. The Moline (IL) Dispatch listed his name among the Fairview Cemetery veterans graves to be honored in May 1929. Son Warren "Eugene" Younkin (1858- ? ) was born on March 25, 1858 in Annawan, Henry County, IL. As a boy, he watched as his home community prepared for the Civil War and then age age 10 endured the death of his army veteran father. He and his single mother relocated to Nebraska in 1880, when he was age 22, and eked out a living as farmers near Dorchester, Saline County. He was joined in holy wedlock with Margaret M. "Maggie" Stephens (1866- 1931), daughter of Edwin and Mary (McDermand) Stephens. They produced three offspring -- Lillie G. Kemper, Clifford E. Younkin and Chloe Riedel. They spent most of the rest of their lives in Dorchester. Margaret is mentioned in a profile of her brother H.L. Stephens in The Centennial History of Oregon, 1811-1912, by Joseph Gaston, and at that time, they resided in Saline County, NE. Sadly, Maggie died at her home in Dorchester on April 1, 1931. Rev. E.H. Jackson of York, NE officiated at the funeral service, held in the local Methodist Episcopal Church. Interment was in Dorchester Cemetery, and an obituary was published in the Lincoln Journal Star. Eugene survived his wife by nearly three decades. 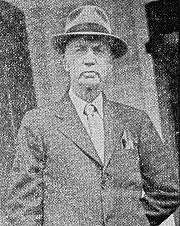 At the age of 80, he lived in Dorchester and was pictured in the Aug. 5, 1938 edition of the Younkin Family News Bulletin. During World War II, he worried when two of his grandsons served in the U.S. Armed Forces. He grieved in April 1947 at the untimely death of 52-year-old, married daughter Chloe Riedel. He finally left Dorchester in the spring of 1950 and moved into the home of son Clifford at 2901 Q Street in Lincoln, NE. At his 93rd birthday on Easter Sunday 1951, Eugene was pictured in the Lincoln Journal Star. Then again when he reached age 101, he was pictured in the Journal Star, saying he could no longer dance a jig and that e would like to grow his hair longer but that it would cause itching. He also claimed that he paid no attention to the United States/Soviet Union space race. Warren died at the age of 101 in Lincoln on March 1, 1960. Burial was in Dorchester Cemetery. Daughter Lillie G. Younkin ( ? - ? ) was born in (?). She wedded William Kemper ( ? - ? ). 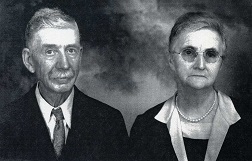 The couple produced at least one son, Willard Kemper. Their residence circa 1931 was in Dorchester. In 1947, she lived in Julesburg, Sedgwick County, CO. 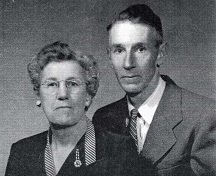 In 1950, her son Willard was united in matrimony with LaVon Fairley, daughter of Ira Fairley of North Platte, NE. At the time of marriage, LaVon was employed as a teacher with the University of Nebraska Extension Department and had spent a year teaching in the Panama Canal Zone. Son Clifford E. Younkin (1890-1969) was born in 1890. He married Dora Ward ( ? - ? ). They were the parents of Delores Nedjl, Donald E. Younkin, Robert C. Younkin and Kenneth S. Younkin. They made their home in Dorchester, NE in the 1930s and '40s. He was pictured in the Younkin Family News Bulletin (Dec. 20, 1938). By 1951, he had moved into the city of Lincoln, NE, with an address of 2901 Q Street. During World War II, their sons Donald Eugene Younkin and Robert Clifford Younkin served in the U.S. Armed Forces and were pictured in the April 20, 1944 edition of the Lincoln Star. Clifford was swept away by the Grim Reaper in 1969. Daughter Chloe Younkin (1894?-1947) was born in about 1894 in Dorchester, Saline County, NE. She moved to Lincoln, NE in about 1919, where she was employed with Security Mutual Life Insurance Company. In about August 1926, when she was 31 years of age, Chloe was united in marriage with 32-year-old Charles G. Riedel ( ? - ? ). News of their marriage license was published in the Lincoln (NE) Star. Their two sons were Paul Riedel and Ronald Riedel. Their home in 1930 was at 340 Elmwood Avenue in Lincoln. They were members of the Redeemed Lutheran Church. Circa the mid-1940s, their address was 840 Elmwood Street in Lincoln. Sadness blanketed this family on April 9, 1947, when Chloe died at the age of 52. An obituary was published in the Nebraska State Journal of Lincoln. Son Howard Venvelsy "Velzie" Younkin (1862-1958) was born on May 30, 1862 in Annawan, Henry County, IL. On Nov. 14, 1888, when Howard was age 26, he was united in matrimony with 19-year-old Clara Belle Earl (March 29, 1869-1953), daughter of Willard and Mary Earl and a native of Monroe, IL. They became the parents of Lois Earl Younkin, Ray A. Younkin and Jay A. Younkin. When the federal census enumeration was made in 1900, the family made its home on a farm in Pleasant Hill Precinct of Saline County, NE. Then during the decade between 1900 and 1910, they relocated to a farm in Dorchester Precinct, Saline County, where they appear on the 1910 federal census. They remained in Dorchester for the balance of their lives and were members of the local Methodist church. The couple was socially minded and in November 1942 hosted a cornhusking bee at their home for some 23 friends, relatives and employees of the Ideal Market business. 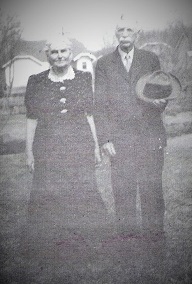 The Younkins celebrated their golden wedding anniversary on Nov. 14, 1938. Clara Belle passed away in a hospital at the age of 84 in Friend, NE on July 24, 1953. An obituary in the Lincoln Journal Star noted that she had been a "resident of the Dorchester vicinity for 74 years" and that she was survived by nine grandchildren and 13 great-grandchildren. Howard outlived his longtime bride by five years. He succumbed at the age of 96 on or about Oct. 1, 1958. A death notice published in the Journal Star reported that funeral services were to be held in the Dorchester Methodist Church, conducted by Rev. Sandsted, with interment taking place in the Crete Riverside Cemetery. 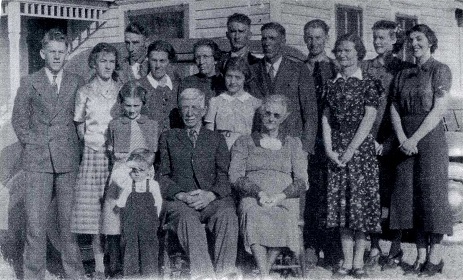 Howard and Clara Belle (seated, center) with their entire family on their golden wedding anniversary. Daughter Lois Earl Younkin (1889-1987) was born in August 1889. She married (?) Hommon and lived in Lincoln. Son Ray A. Younkin (1891-1945) was born in August 1891. Son Jay A. Younkin (1897-1990) was born on Jan. 3, 1897 in Dorchester,Saline County, NE. On Jan. 3, 1922, at the age of 24, Jay married Esther Scott (Dec. 24, 1896-1984) in nuptials held at Dorchester. She was the daughter of Frank Augusta and Esther Ann (Box) Scott. The couple produced four known children -- Margaret Schnell, Ruth Virginia Reim, Dean Allen Younkin and Wallace Younkin. Their home was in Dorchester for decades. As they aged, they moved to Western, Saline County. When the Younkins celebrated their 50th wedding anniversary in 1972, an open house was held for them at Western United Methodist Church. Sadly, Esther passed away in Crete, NE at the age of 87 on Feb. 6, 1984. Jay celebrated his 90th birthday in January 1987 and his photograph was printed in the Lincoln Journal Star. The family organized a card shower and family dinner. At the time, he had eight grandchildren and a dozen grandchildren. He passed away in Lincoln at age 93 on May 23, 1990. Burial was beside his wife in Dorchester Cemetery. Granddaughter Margaret Younkin ( ? - ? ) wedded Karl Schnell ( ? - ? ). In 1971-1986, their home was in Gretna, NE. Granddaughter Ruth Virginia Younkin ( ? - ? ) was born in (?). On March 12, 1950, she was united in holy matrimony with Fred Reim ( ? - ? ), son of Herman Reim of Ashland, NE. Rev. Robert L. Embree officiated at the ceremony held at the Dorchester Methodist Church. News of the wedding was published in the Lincoln (NE) Journal Star. On their honeymoon, the Reims traveled to New Orleans and other southern sites. They made their first home on a farm in Memphis, Saunders County, NE. By 1971, they had relocated to Ashland, NE. Grandson Deane Allen Younkin ( ? - ? ) was born in (?). On June 15, 1958, he was joined in wedlock with Betty Lee Damke ( ? - ? ), daughter of Clyde Damke of Western, NE. At the time, Deane worked in Lincoln, and Betty Lee was employed as a teacher near Western. They made their residence in 1971 in Lincoln, NE. Grandson Wallace Younkin ( ? - ? ) dwelled in Wichita, KS in 1971-1986. Eva's daughter Kittie May Gillaspie (1874-1950) was born on Oct. 7, 1874 in Annawan, Henry County, IL. In about 1897, when she would have been 23 years of age, she married 33-year-old Iowa native Roy Peterson (1865- ? ). The couple produced these children -- Juanita V. Morrow, Lela B. DeWitt Christensen, Gladys Carlile, Floyd L. Peterson, Russell Chester Peterson, Orville C. Peterson and Thomas L. Peterson. The Petersons' home in 1900 was on a farm in Dorchester, Saline County, NE. Between 1905 and 1908, the family relocated to a farm in Allen, Mesa County, CO. During the early 1910s, they relocated again to a farm in West Benton, Newton County, MO and thence to Oklahoma, where their son Thomas was born. They relocated yet again, during the 1920s, to Los Angeles, CA. The federal census of 1930 shows Roy with no occupation and Kittie employed as a helper in a restaurant. Son Russell, age 22 and unmarried, earned income as a grocery salesman. Kittie passed away at the age of 75 on Feb. 2, 1950. Burial was in Forest Lawn Memorial Park in Glendale, following funeral services held at the Little Church of the Flowers. A death notice was published in the Los Angeles Times, naming her Scherzer and Younkin siblings. Daughter Juanita V. "Neta" Peterson (1898-1977) was born on Sept. 26, 1898 in Dorchester, Saline County. She wedded (?) Morrow. Evidence suggests that she passed away in Los Angeles on April 27, 1977. Daughter Lela B. Peterson (1901- ? ) was born in about 1901 in Dorchester. At the age of 17, in about 1919, she married John W. DeWitt ( ? - ? ). They lived in Oklahoma circa 1922-1923 before relocating to Los Angeles by 1925. Their offspring were John W. DeWitt Jr., twins Melvin DeWitt and Milton DeWitt, Paul DeWitt and Carolyn R. DeWitt. Circa 1930, they lived two houses away from Lela's parents in Los Angeles, with John working as a milk salesman. The DeWitts relocated by 1935 to Zumwalt, Lane County, OR, where John found employment in a garage. At some point, she married a second time to (?) Christensen. She was still living in 1983. Grandson John W. DeWitt Jr. (1923- ? ) was born in about 1923 in Oklahoma. Grandson Melvin M. DeWitt (1925- ? ) was born in about 1925 in Los Angeles, a twin with his brother Milton. Grandson Milton K. DeWitt (1925- ? ) was born in about 1925 in Los Angeles, a twin with his brother Melvin. Grandson Paul E. DeWitt (1928- ? ) was born in about 1928 in Los Angeles. Granddaughter Carolyn R. DeWitt (1937- ? ) was born in about 1937 in Oregon. Daughter Gladys M. Peterson (1902- ? ) was born in about 1902 in Dorchester. She was joined in wedlock with (?) Carlile. Son Floyd L. Peterson (1905- ? ) was born in about 1905 in Dorchester. Son Russell Chester Peterson (1908- ? ) was born in about 1908, the first of the offspring to be born in Colorado. Son Orville C. Peterson Sr. (1911-1983) was born in about 1911 in Colorado. He married Dorothy E. ( ? - ? ). They were the parents of Joanne Sherman, Orville C. Peterson Sr., Dawn F. Hickey and Beverly D. Toffel. Orville worked over the years as an officer with the Los Angeles Police Department. Circa 1949, he transferred from a role at the City Jail to the Central Division. He died in Nov. 1983, with services held at Church of the Hills in Forest Lawn Cemetery in Hollywood Hills. A death notice appeared in the Los Angeles Times. Son Thomas L. Peterson (1922- ? ) was born in about 1912 in Oklahoma. Eva's daughter Hattie E. Gillaspie (1876- ? ) was born on Aug. 7, 1876 in Annawan, Henry County. At the age of four, her parents having divorced, she and her mother and older half-brothers migrated to Nebraska. "They settled in a log cabin on a farm near Dorchester," said the Lincoln Journal Star. When she was age 12, in 1888, Hattie endured a blizzard while walking to school. Said the Journal Star, "She and a brother and sister followed fence posts to find their way." In 1898, at the age of about 22, Hattie was united in matrimony with Lewis H. Scherzer (Jan. 22, 1872-1939). The Scherzers bore five children -- Viola Mae Gollner, Frances A. Johnson, Margaret Husted, Winifred Pughe and Frederick "Robert" Scherzer. They dwelled in Lincoln, Lancaster County, NE. Hattie was known for cooking German dishes, including "Knipp" which consisted of pork mixed with oatmeal and then fried. Lewis died on March 15, 1939. Hattie lived for another three-plus decades as a widow and spent her final years in the home of her daughter Mrs. Johnson in Lincoln. When she celebrated her 90th birthday in 1966, she was pictured and profiled in the Journal Star. The article noted that "Not one to be idle, Mrs. Scherzer keeps up hobbies of crocheting, embroidering and solving crossword puzzles. She also enjoys television serials." She joined him in death on April 5, 1973. They rest in Wyuka Cemetery in Lincoln. Daughter Viola Mae Scherzer (1914-1993) was born on June 19, 1914 in Lincoln. She wedded Harry M. Gollner (June 22, 2914-1992). The couple did not reproduce. Over the years, Viola earned a living as a data entry supervisor for Centel in Lincoln. Their address in the early 1990s was 6709 Teton Drive. Harry died at age 78 on Sept. 22, 1992. Viola only lived for another year as a widow. She passed away at the age of 79, in Lincoln, on Oct. 15, 1993. The Lincoln Star printed a death notice. Interment was in Unadilla Cemetery in Otoe County, NE. Daughter Frances Scherzer (1909-1994) was born in about 1909. At the age of 27, on June 20, 1936, she married Wallace Johnson ( ? - ? ). The nuptials were officiated by Rev. Hugh Lomax and held at Bethany Christian Church in Lincoln. They were the parents of Connie Johnson and Linda Ekiss. In 1966, their home was at 2666 Colonial Drive in Lincoln. They were members of Bethany Christian Church, and she belonged to the Order of Eastern Star, Daughters of the Nile, National Camping Travelers Association and Campign Sams. Her address in 1994 was 3307 South 52nd Street in Lincoln. She died at the age of 85 on May 3, 1994. Interment was in Hordville Cemetery. A death notice was printed in the Lincoln Journal Star. Granddaughter Connie Johnson lived in Lincoln in 1994. Granddaughter Linda Johnson wedded (?) Ekiss. Circa 1994, she dwelled in St. Marys, OH. Daughter Margaret Scherzer ( ? - ? ) was born in (?). On March 13, 1937, she was joined in wedlock with Earl C. Husted ( ? - ? ), son of Ada Husted of Lincoln, NE. The ceremony for 20 guests was held in the home of Margaret's married brother in Lincoln, with Rev. Hugh Lomax officiating. Their residence in 1941 was in Long Beach, CA and in 1966 was in Torrance, CA. She resided in 1994 in Sun City, AZ. Daughter Winifred Scherzer ( ? - ? ) was born in (?). She was united in matrimony with Orville Pughe ( ? - ? ). They lived in Bellflower, CA in 1966-1973. Her home in 1994 was in Sun City, AZ. Son Frederick "Robert" Scherzer ( ? - ? ) was born in (?). On March 13, 1929, at White Hall in University Place in Lincoln, he married Junie Kathryn Krause ( ? - ? ), daughter of Albert Krause of Weiser, Idaho. Rev. J.K. O'Heeron officiated. They bore two children, Robert C. Scherzer and Ann Rudd. Junie was a graduate of Lincoln General's nursing program. Circa 1939, Robert and family were sent to the Panama Canal Zone, where they lived in Balboa and he worked for the government. They taveled to Lincoln for a visit in October-November 1941, sailing from the Canal to San Francisco. On that three-month vacation, they visited with Robert's sister Margaret Husted in Long Beach, CA, and with the Krauses in Idaho. They traveled further east to Buffalo, NY and to spend a few days touring New York City. The Scherzers remained in the Panama Canal Zone until retirement. They dwelled in Downey, CA in 1966-1994 at the address of 13224 Stanbridge Avenue. He was an active member of the Masons. In March 1979, they celebrated their golden wedding anniversary with a buffet and reception hosted by their daughter, with the news covered in the Lincoln Star. Granddaughter Ann Scherzer married Wayne Rudd. They had one known daughter, Deborah Rudd. Research for this page graciously shared by the late Olive (Rowan) Duff, the late Donna (Younkin) Logan and Robert LeFevre Younkin working with Robert J. Libby.